The Big List of Michigan Nursing Homes and Rehab Facilities. Find nursing homes anywhere in Michigan. Includes Medicare and Medicaid rehab, Alzheimers Care, and nursing centers. 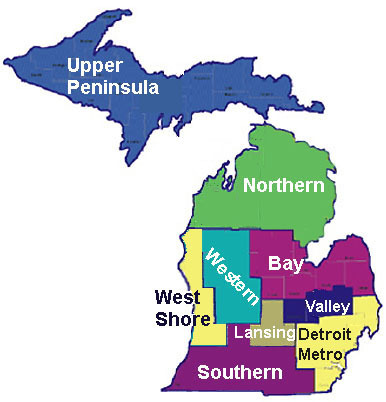 Lists for Michigan regions, counties and princiopal cities. If you're looking for a nursing home in Michigan, chances are you'll find it here. You will also find helpful info about long term facilities, like articles about money and cost questions, how to choose a provider, and how Medicare and Medicaid work -and don't work-- for nursing home costs. Most of our listing data come from federal resources like Medicare.gov and state records as in the Michigan Department of Licensing & Regulatory Affairs. Click here or on the map. This information is provided as a public service. While every effort is made to assure accuracy, the information may not be correct due to changes in provider status, name, address or other facts. Do not use this information as a sole source in selecting a home care or home nursing service. Among people turning 65 today, 69 percent will need some form of long-term care, whether in the community or in a residential care facility. The number of nursing homes in Michigan, with 46,356 beds. This page is about Nursing Homes in Michigan. VIDEO: What is an "ombudsman?"